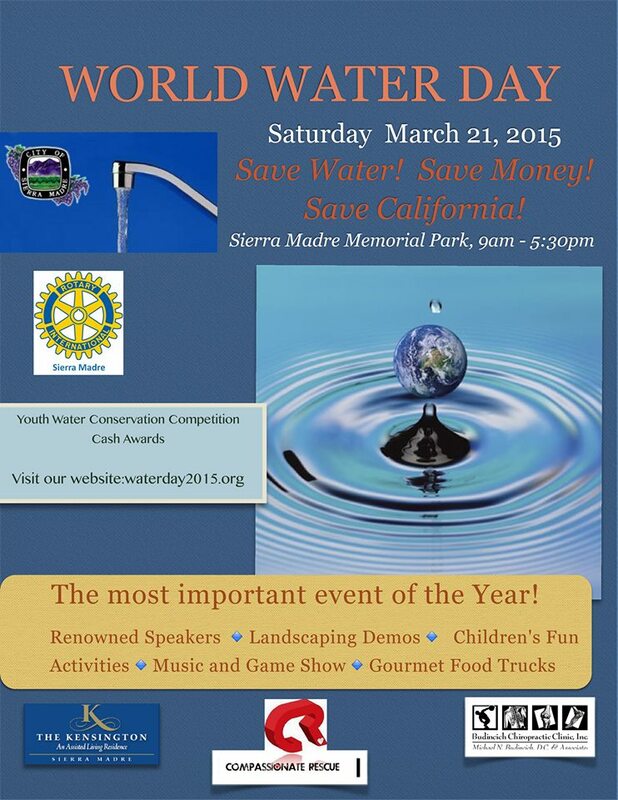 Press Release posted 3/20/15 – WORLD WATER DAY, SIERRA MADRE, MARCH 21, 2015 – Memorial Park – 9am-5pm. This community event brings together world class speakers, renowned landscapers, star musicians, Water Wizards game show with celebrated game show host, children’s activities, booths with interactive activities and invaluable information about your water, a tour of our water treatment plant and some of the best food trucks in LA. This event is sponsored by the City of Sierra Madre and the Sierra Madre Rotary Club. 9:15 A PANEL OF EXPERTS ON CALIFORNIA’S WATER CRISIS – City Council Chambers, City Hall. Accompanying Famiglietti is a dynamic panel with each speaker giving a short presentation, followed by an engaging panel discussion and a Q & A. 1:30 Afternoon Session: water issues, planning, and conservation facing our local community. Afternoon Keynote: Tom Love, PE of the San Gabriel Valley Water District, Topic: Long term sustainability of the San Gabriel Valley water resources and Southern California’s water supply. Bruce Inman, Director of the Sierra Madre Public Works; Sierra Madre-specific water topics, including water rights, water sources, status of conservation efforts, turf rebate program, and current city water conservation regulations. Kelley Hanna with Water Wise Now; Irrigation solutions and greater water efficiencies. 11:40 Students from schools throughout the area will have their entries to the Youth Water Conservation Competition displayed in the park and will be presenting their projects. 12:00 and 1:00 PREMIER MUSIC BY SMITTY AND SON. Sasha Smith on keyboard; has worked on Emmy winning and Grammy nominated projects, and has performed with Sia, Ariana Grande, Fred Armisen, Everclear and others. Eamon Ryland; has played pedal steel and guitar with Mandy Moore, Kyle Cook (Matchbox 20) and Slash (Guns&Roses) and written for artists ranging from Mickey Avalon to Shaun Ryder (Happy Mondays). 12:30 GAME SHOW, ‘Water Wizards’, with game show host Dave Ruprecht, the game show host for Supermarket Sweeps for 15 years, Audience contestants have a chance to win prizes. Final contestants will close our day. CHILDREN’S ACTIVITIES will be held throughout the day, with satellite displays and activities from JPL, a fun-filled presentation on water by with the San Gabriel Valley Water District at 10 and 2, watercolor painting, Sculpturing, animated videos, the Water Wise Owl and more. FOOD TRUCKS: MiddleFeast, Me So Hungry, Poke 2 go, Wise BBQ and Sweet E’s Bake shop. For more information and volunteer opportunities, visit www.waterday2015.org and save the date in Sierra Madre.